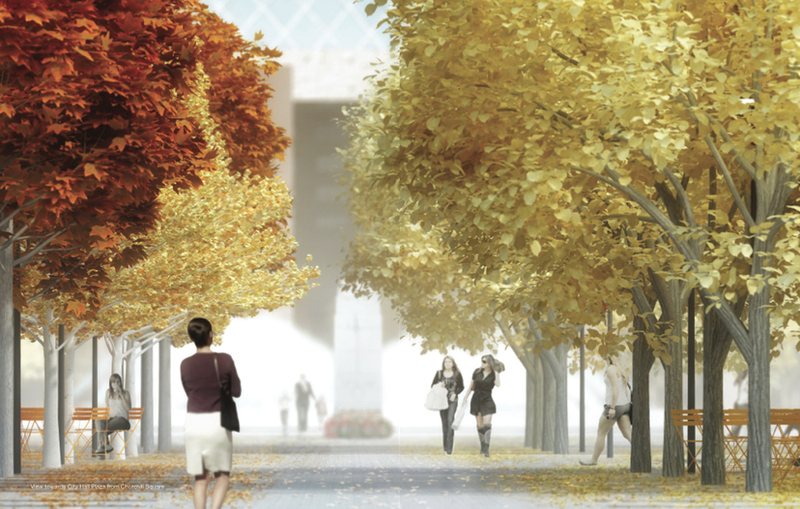 Edmonton’s Civic Precinct Master Plan activates a vision that will see the city’s civic core transformed into a vibrant, sustainable urban realm. 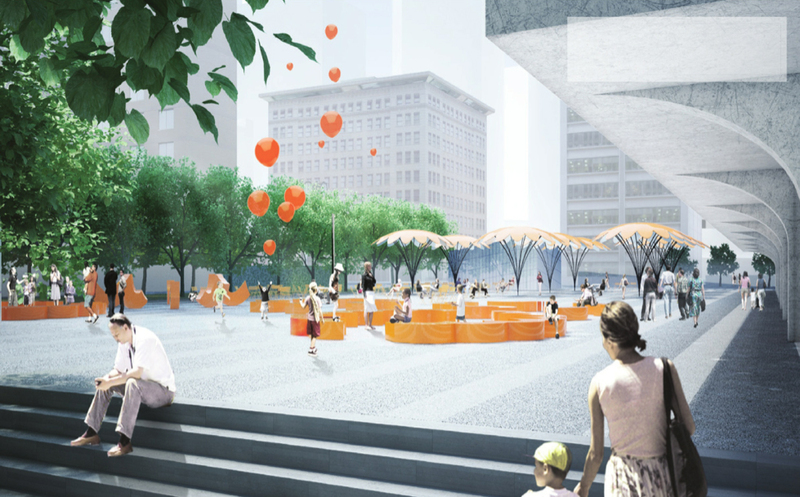 Developed to join and integrate existing institutional, civic, arts and entertainment organizations with the new surrounding catalyst projects the master plan provides a phased unifying urban design. 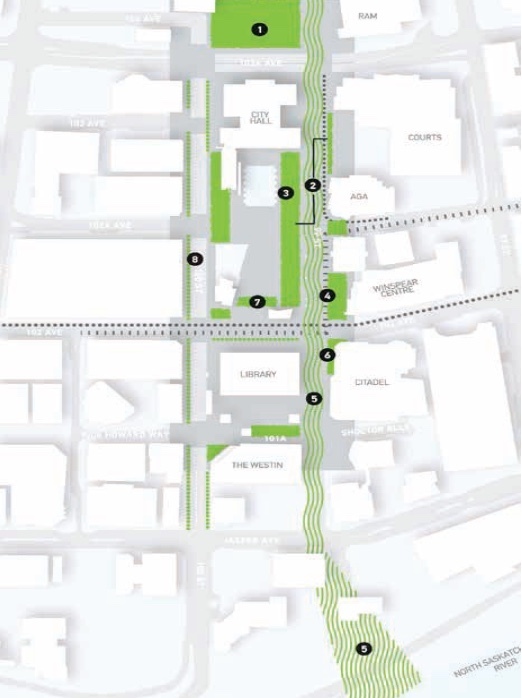 The Civic Precinct Master Plan takes its place among a number of ambitious city-building initiatives supported by Edmonton’s “The Ways” documents, including projects on Jasper Avenue, 108 Street (Capital Boulevard), the proposed Arena and associated entertainment precinct, The Quarters, Chinatown, the conceptual proposal for the Performing Arts Centre (PAC) and the Royal Alberta Museum (RAM). 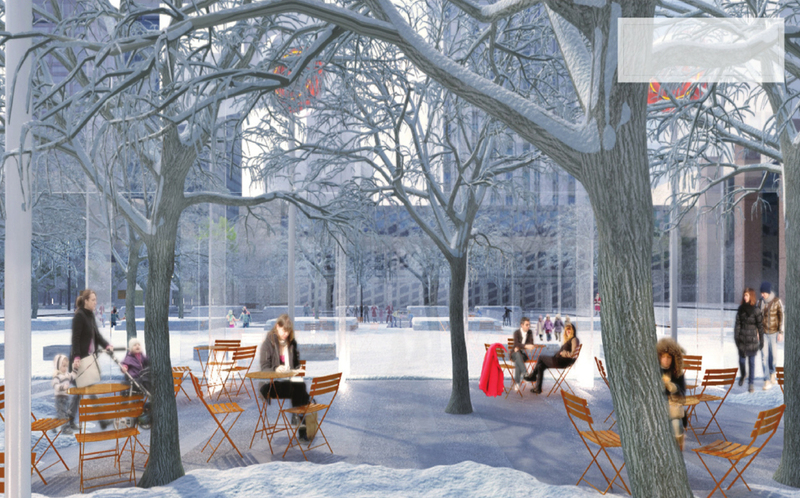 The plan recognizes the unique character of the place, with its mix of major cultural and civic amenities centrally located. It takes the civic core beyond the idea of a hub to create an open urban heart that elevates these amenities, opening up north-south and east-west connections to sustainable transportation, automobile traffic, and Edmonton’s iconic river, meshing the plan into the larger urban context. The master plan looks at the entire central civic area, loosely bounded by 100 St. to the west, 99 St to the east, extending just north of 103 Ave, and south to 103 A Ave.
Won through a competitive process, the design team was composed of Kasian as the Prime Design and Project Management Consultant with Gehl Architects from Copenhagen and GH3 in Toronto. Vaughan Hoy led the pursuit of this project with international design partners and was the principal in charge and project architect directing a team of seven consulting firms. The master plan took approximately a year to complete. 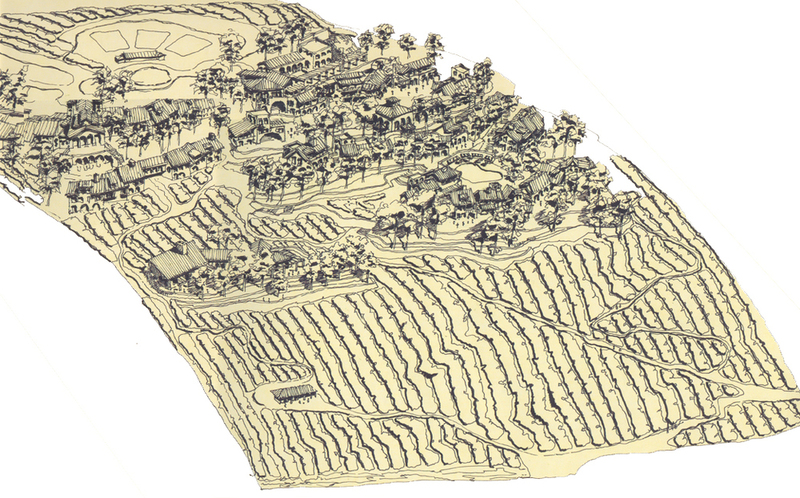 Conceived as one of China’s new ‘Hawaii’ type destination and vacation retreats, this 500 acre project included single family residences and town homes, commercial village, resorts, casinos and hotels, amusement and water park, marinas and yatch club, vineyards and winery, and public parkland reserve that included trails, beaches and an interpretive centre. Planning incorporated an intent for slow phased sustainable growth preserving significant tracts of the natural environment. 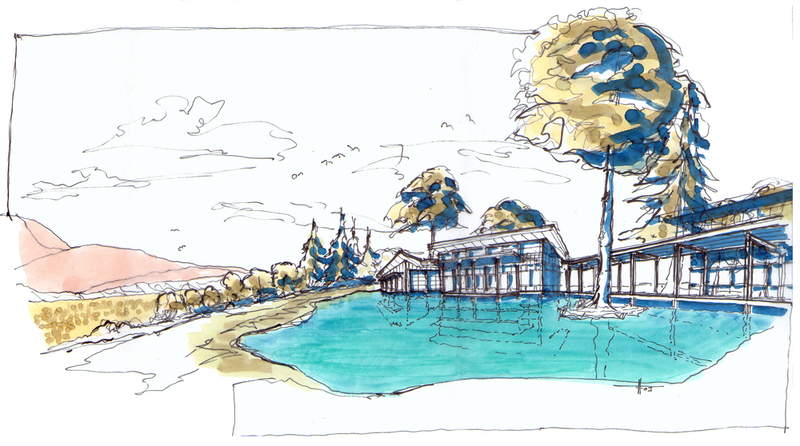 This commission was for the master planning and design of a new retreat centre atop the foothills of Mission, British Columbia overlooking the Fraser Valley. Sponsored by the Buddhist Church the Mission Retreat Centre aspires to create a full retreat, education and worship centre with guest facilities and retreat bungalows. Situated on a pristine 150 acre site with an existing farm and farm buildings, the intent in the planning was to leave as much of the existing site and natural features untouched building only in existing open space. The heritage farm and buildings would be refurbished and reused as short term residence and carpentry shops. The program called for a regional architectural design approach in largely wood frame and heavy timber construction. Two phases were planned for; the first phase being the education retreat on the south edge of the site overlooking the valley, and a second phase which would be the long term retreat and monastic quarters. Phase 1 included education buildings, administration offices, communal dining hall, meditation and multi-purpose hall, monks cottages, and short stay living units for visitors. The communal program elements were planned and linked by open covered walkways around an artificial water body supplied from captured rain water run off from buildings. This natural cistern acted as a filtration area for garden agricultural use on the farm. This provided an enhanced environmental experience. Building scale, geometry, and groupings were particularly controlled to create heightened experiences in and around the facility for the users. 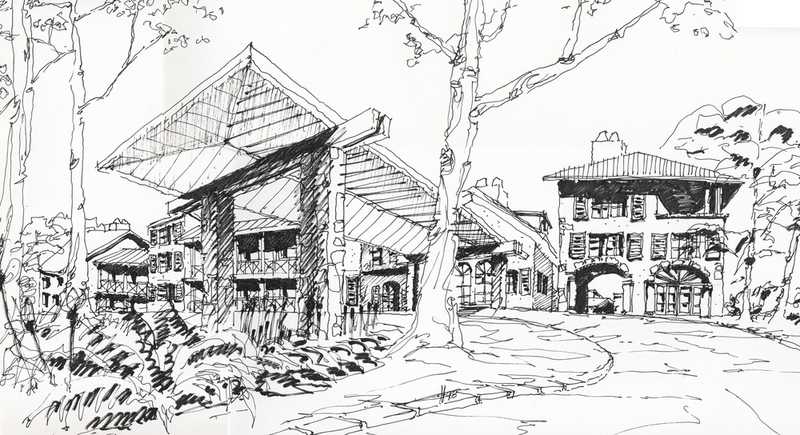 Phase 2 which was intended to be separate and more remote from the public provided facilities for guests and members of the faith embarking on longer term retreats and education and included residential rooms, meditation and worship hall, communal dining and support, library and administration. Located in the beautiful semi-arid belt on Lake Chelan, Washington State, this time share project is part of a larger new community and working vineyard estate. With extraordinary scenery and natural landscape the time share occupied the southern end of the site on the hill crest and slopes falling towards the lake front, capturing exceptional exposure all year round. The program called for a 110 unit timeshare complex with full amenities and a future 120 unit hotel. The timeshare was serviced with complete vacation amenities such as a vineyard restaurant and cabana, tennis courts and club house, and WorldMarks 'The Club at Lake Chelan' private club and spa, with semi-private swimming pools throughout the time share complex itself. 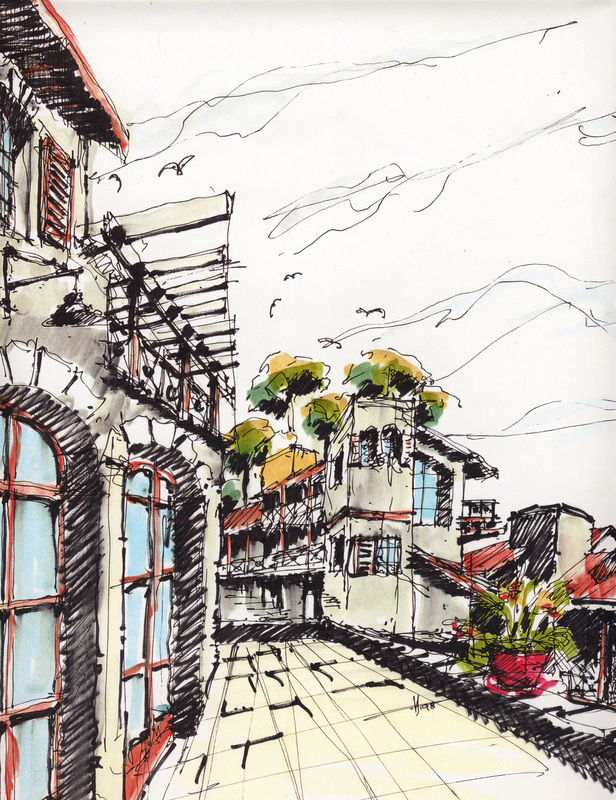 Designed with the magnificent natural hillside geography in mind, the streets which were essentially pedestrian in quality and character ran across the slope in the east / west direction facilitating southern facing exposure and aspects for all the residential units. As part of a larger development, this site would grow in phases to include a 47 unit townhouse neighbourhood located mid-site, 18 free hold residential lots with homes varying between 2,500 sq. ft. to 5,000 sq. ft., and a small village centre set in landscaping as a complete local service centre and entry gateway to the complete community. The entire site is designed to maximize low energy sustainability principles with rain water capture and natural filtration as part of the agricultural system, low energy efficient private, semi-private and public buildings that maximized natural solar gain during winter and summer cooling from the lakeshore air exchange. Situated on 800 acres of coastal estuary this community was planned for 5,000 residents, with full municipal and private support facilities and infrastructure, and private and public amenities. 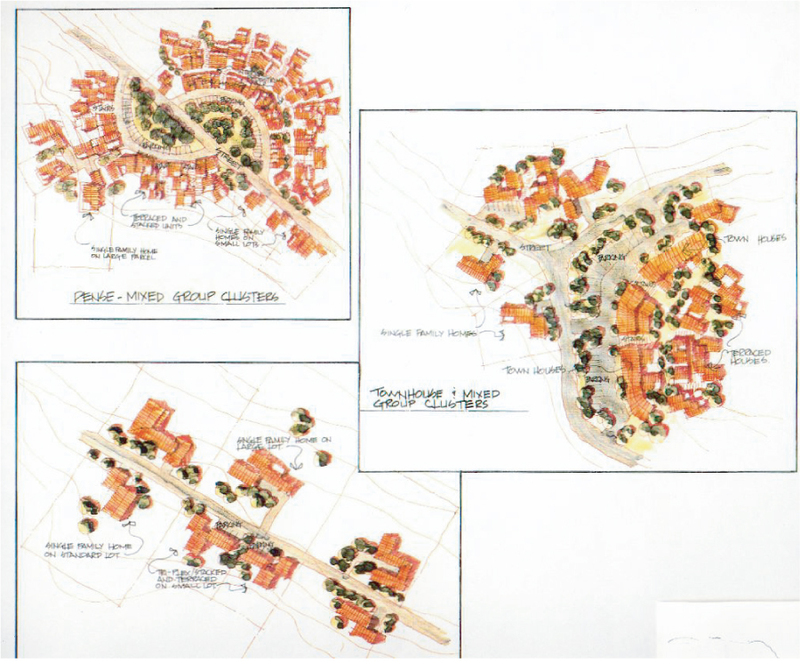 The rolling hill terrain permitted a number of varied development typologies and enclaves of clustered and stepped housing with a full service town centre as the village core. This masterplan was conceived of as an island community of 1,200 people with complete municipal support services and facilities ranging from schools to community centre and theater, gulf course, equestrian centre and marina. Located in the Fraser River in Surrey, BC, this project supported a range of urban style town homes and single family residences. 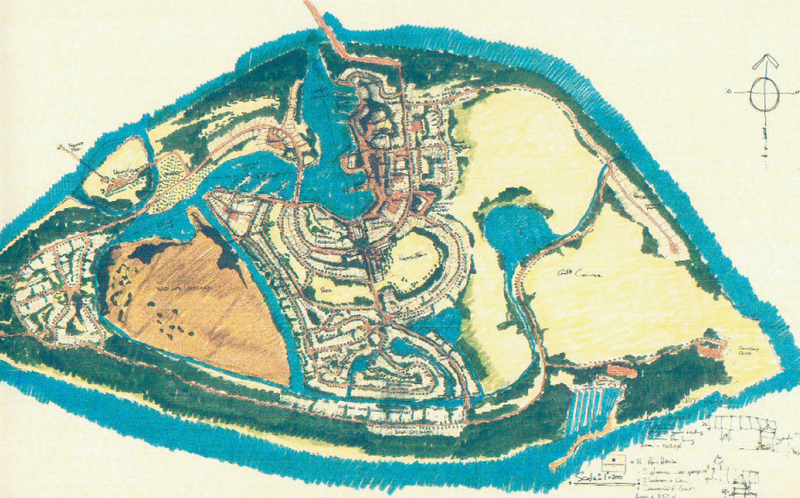 As part of the town core the plan supported light water front industrial studios for cottage industries along the marina water front and provided preserved ecological wetland parks.